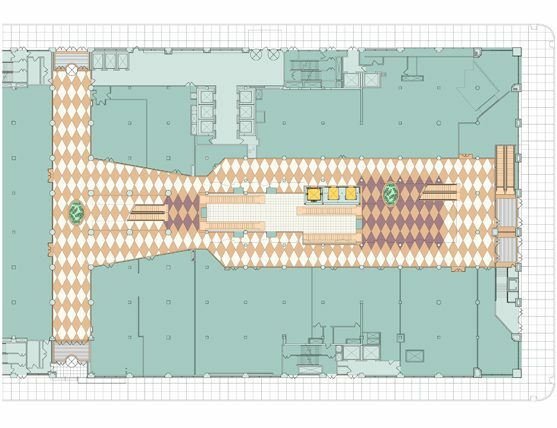 A dated vertical mall was reconfigured to accommodate a large new anchor tenant. To better distinguish between office and retail space, we provided a constellation of consistent interior treatments that sweep away a jumble of styles. A new floor pattern is scaled to fit the grand scale and enliven the interior volume. 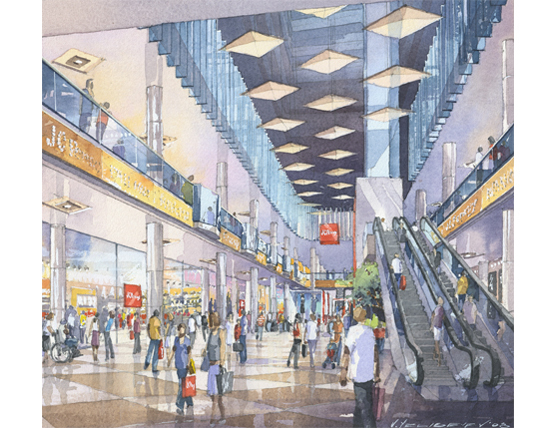 Proposed balconies along the second-floor concourse add variety and interest as well as opportunities for additional seating or retail kiosks. Strategically placed stone planters and benches provide customer rest. Staid offices above are veiled with a dramatic field of carbon fiber “clouds” floating at the ceiling level of the third floor to contain the vibrancy of the retail experience below. Office tenants continue to have a view outward and below. The retail element is visually capped yet daylight will continue to filter to the atrium floor.